Too lazy to find a better thread picture. Edited by Tale, 12 September 2015 - 12:46 PM. So...biggest question first, can Luffy's Hardening block Law's derpslice? And can Law react to G4 speed? Also, the amount of knowledge them both would have of each others abilities would be big. Luffy could figure out how to block Law's slices, and Law could figure out what kind of Gears Luffy can do, so he can plan accordingly. They fight very differently so it would be interesting to see. Gama knife will oneshot luffy if it hits. this one is a given. however. luffy will one shot law if he hits him with even one gear fourth hit. on the flip side, no. I don't think luffys haki is good enough to ignore a durpslice, so he either has to avoid the hits or law will take this one. 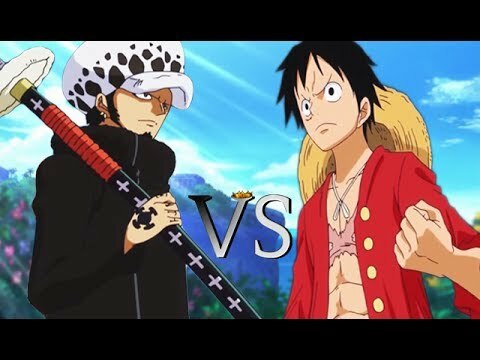 however, knowing luffy is so adept at improv, id wager law catching luffy with a shambles isn't nessisarily the end of the fight..
Edited by retroluffy13, 13 September 2015 - 09:22 PM. when you love something.. and I mean. really love it. you fight for it for as long as you can until you cant stand any longer. then when its all said and done, walk away with a smile hoping you did right. I think Shambles can put Luffy in quite the pickle, even if he can't be affected directly by Law's Derpslice. If Law fights using misdirection like he did when he fought Smoker, he can possibly trip Luffy up enough to win, before Luffy can use Gear 4. The environment could play a big part in whose victorious. However, if Luffy reaches Gear 4, Law can kiss his chances of victory goodbye. He won't be able to do anything aside from attempt to run from Luffy, whose speed would most likely be too much for him. Vergo was able to blitz Law before he could do much of anything, so it's likely Luffy could do the same. Edited by laxus pwns natsu, 14 September 2015 - 10:46 PM. Luffy brute strength would be a problem but I think Law could take it. Plus has attacks like Mes and Gamma knife which are guarnteed to end the fight.